Digimon: System Restore: Data Squad Episode 37: The Battle With Belphemon! One of the weird idiosyncrasies of Digimon is that the art style has subtle variation from episode to episode. Usually it's not worth commenting on, especially in the earlier seasons when the art style is generally crap anyway. When the subtle variation in art reaches the far end of the spectrum, however, it may not be so subtle anymore. Previously this had been most notable in certain episodes of Zero Two, where everything looks a little more rigid and tight. In theory, that sort of art should work well here, in the middle of a climactic fight against Belphemon. There are several reasons why it doesn't. Not all of them come in pairs. While the Hosoda touch in episode 21 of Adventure added a lovely bit of mystery and intrigue to the affair, the style here oversells the action. The angles are weird, the shading is distracting and everybody generally looks way too serious. It's odd that that's a flaw since everybody's supposed to be serious, but it all feels so over-dramatic. This seems to inform the dialogue and voice acting, which overplays everything in response. It feels like somebody changed the channel and we're suddenly watching Berserk or something. Appropriate, perhaps, but it makes it more difficult to pay attention to what's actually happening. All the ladies suddenly developing a case of giant knockers doesn't help either. The primary focus starts with Thomas and shifts to Keenan, then Marcus. 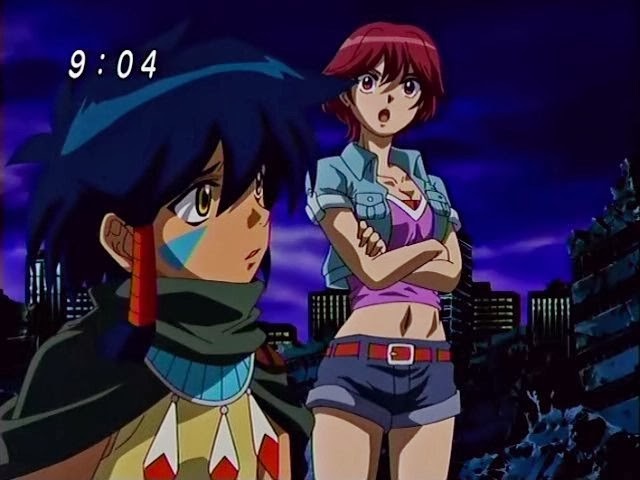 This is hard when half the episode is spent doing double-takes at Miki and Megumi while speculating how Yoshi's shirt suddenly seems to have shrunk in the wash. The dub even has to cover up Miki and, unlike some of the more prudish alterations made in Fusion, it's hard to argue with this course of action. It's really hard to earn credibility when the most memorable thing is not Keenan sending Falcomon Mega or Agumon's miraculous rebirth but rather some expansive busts. That's a shame as the shift of emphasis from Thomas to Keenan to Marcus is very well orchestrated. Thomas re-establishes his loyalty to DATS, shrugging off a punch from Marcus and going about his business. With the girls and Keenan's troops strained, MirageGaogamon becomes the primary weapon. Thomas's strategies all work successfully and create openings, but don't do damage. Kurata is quite impressed with his new Belphemon suit and gloats about his ability to harness the raw power of Digimon. His claims that Digimon are soulless and should only be enslaved or destroyed sets Keenan off, sending Falcomon to Mega form. Just as Crowmon did in his debut, Ravemon uses his new evolution power bonus to land some blows on Belphemon. As a result, the chains come off and the power of Belphemon Rage Mode is fully realized. Seemingly in defiance of what Kurata had just said, the soul of Belphemon seizes control from Kurata. Nobody puts Belphie in the corner! And regardless of the status of Kurata's negotiations for world control, the whole planet's going down. Thanks to a clutch sacrifice from Ravemon and Keenan, Marcus ends up being the only hope left. It takes another impassioned plea and another round of tears to get the egg to hatch. Clearly, it wasn't just about Marcus wanting it, however. It was about Agumon realizing that he has unfinished business. He wants another chance, and he just needed to hear Marcus agree to get the surge of energy to break through. It's two partners in lockstep that makes it happen, and it's apparent that those two in tandem can be a lot more powerful than whatever Kurata and Belphemon have going. 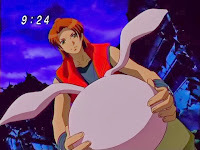 While Marcus accepting Thomas back is played out in the typical overblown style of the episode, Yoshi's reluctance is surprising. She seems very hurt by his betrayal and really wants to say something, but holds her tongue for the sake of the team. These last couple episodes have shown that Yoshi suppresses a whole lot for the sake of the team, and there's something admirable about that. Speaking of which, we get so dialed into the fight between Belphemon and MirageGaogamon that Rosemon stepping in to save her teammate actually becomes a pretty sweet moment, ushering in the cavalry to continue not doing any damage. We've recognized it in the past, but this is the first time Keenan acknowledges that Merukimon was like his father, attributing his growth to him as much as Frigimon and later Marcus. 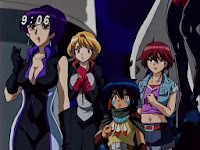 The pronunciation of Ravemon is a little odd, as he's clearly based off a raven, but the way his name is said sounds more appropriate for Gwappamon. In a beautiful nod to the first Adventure movie, the first thing the newly born Koromon does is eat Marcus's face. BanchoLeomon had said that Agumon probably won't remember Marcus, and this is treated as one of those “screw the rules, Marcus is a man” moments, but Biyomon's death and rebirth creates precedence. It can be argued that Biyomon's love for Kristy was intense but unfocused, leading to the erratic rebirth. Agumon's relationship with Marcus is more matured and allows him to defy the odds. Speaking of Kristy... yeah... the art style got her too.